I know that the allure to this post isn’t necessarily in its taste, but rather in its health benefits. But trust me, it’s really tasty and an amazing way to jump-start your day. About two weeks ago, I decided that I would start juicing again. Typically, we start our mornings with a very generous cup of coffee along with a bowl of cereal. Last month we switched over to non-dairy milk. I never dreamed that we would ever switch from dairy to non-dairy milks, let alone stop drinking coffee first thing in the morning. Then one night, as I was putting away the last of the dishes, that’s exactly the idea came to me. I decided that instead of coffee, we would start our mornings by flooding our well-rested bodies with as many nutrients as possible. Surprisingly I haven’t missed or craved coffee as much as I thought I would. And luckily, I haven’t had any withdrawal symptoms that some experience when cutting back on caffeine. Actually, I’ve felt more satiated and feel pretty energized throughout the morning, which I attribute to my body getting the nutrients it needed. Additionally, I have tried to incorporate more flaxseed oil into our diets. On a recent trip to visit family, Ned was given the book, “The Budwig Cancer and Coronary Heart Disease Prevention Diet”, which he read and passed along to me. In it, Dr. Johanna Budwig, a German biochemist, who held doctorates in both physics and chemistry, shares recipes and the guidelines for her diet which she used to treat the sick. The diet is said to benefit people with heart disease, those undergoing chemotherapy for quick regeneration of the immune system, as well as chronic gastrointestinal diseases, just to name a few. One of the key principles of the diet is the use of flaxseed oil along with cottage cheese or quark. Flaxseed oil contains alpha-linolenic acid (ALA), an omega-3, which is one of the two fatty acids that our bodies need but cannot produce naturally. Quark is a protein-rich, dairy product that is similar to cottage cheese. Dr. Budwig found that the sulfur-rich amino acids in quark, cottage cheese and yogurt when blended along with cold-pressed flaxseed oil make the oil more water-soluble and easier to metabolize and digest. Make sure that when you buy flaxseed oil, that you buy only cold-pressed and organic oils. Use a spoon to scrape the inside of the banana peel. All of this brings me to back to the smoothie. It’s chock-full of healthy and wholesome ingredients. Each batch makes two 16-ounce servings. And each serving contains half a cup of anthocyanin-rich raw red cabbage, as well as a tablespoon of cold-pressed flaxseed oil. I also add raw, ground flax seeds. 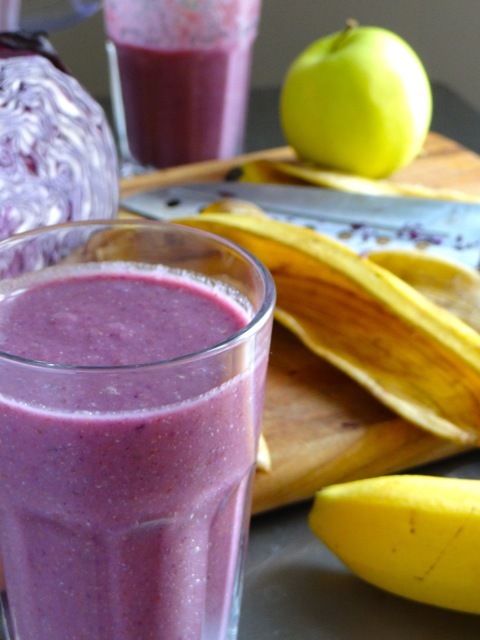 I use an apple and banana to add texture, body, flavor and nutrients. Normally, I don’t bother peeling or coring the apple. Instead, I cut the entire apple, including the seeds, discarding only the stem. And once I’ve peeled and cut the banana, I use a spoon the scrape along the inside of the peel to make sure that we get all the fiber and nutrients from the fruit, which is an especially good practice when buying organic bananas – waste not, want not. And lastly, I’ve added chia seeds which not only add texture but also provide calcium, fiber and protein. Should you need additional sweetness, add a half a cup of sugar-free fruit juice or a few tablespoons of honey or agave. Place all ingredients with the exception of the flax seed oil and ice cubes in a blender. Blend until mostly smooth, about 30 seconds to 1 minute. Then, turn off the blender and add the flax seed oil and ice cubes. Blend until ice cubes have been crushed. Serve and drink immediately. If you have aVitamix or another high-performance blender, you might consider not blending the mixture longer than 30 seconds. It is important not to let the contents “cook” with the heat created by the friction of your blender. Flaxseed oil loses its potency, when heated beyond 115° F.